sorry for not letting this go but at this point it's a curiosity thing for me, just trying to figure out if there's something I'm missing here. so you're working from this side to remove the hub & sprocket from the other side of the swing arm? Loose the chain, remove those 5 nuts and your sprocket is free to slide toward the left. NO NEED to remove the axle nut, or the hub in any way. ok I guess I can see that now, as long as you are rotating the hub & sprocket so you can get at those 5 nuts one at a time. I never would have come at it that way, but interesting. The one problem with this method is you have to have the wheel off the bike and you have to have the rear up on a stand. The rear stand I use would not allow for that. A center stand would. Removing the hub is still the best method for my setup. Well now you've got MY curiosity up!lol.What setup do you have that warrants removing the hub?A reason to check the bearings?or what. What setup do you have that warrants removing the hub?A reason to check the bearings?or what. so the first time I had to do this was when I bought the Extreme Creations "hyper drive" which is 38t rear sprocket and requires their hub to use that sprocket, this was when I ran the LSR. And I change the rear sprocket (still using the OEM hub) frequently going back-n-forth from the track to canyon riding. 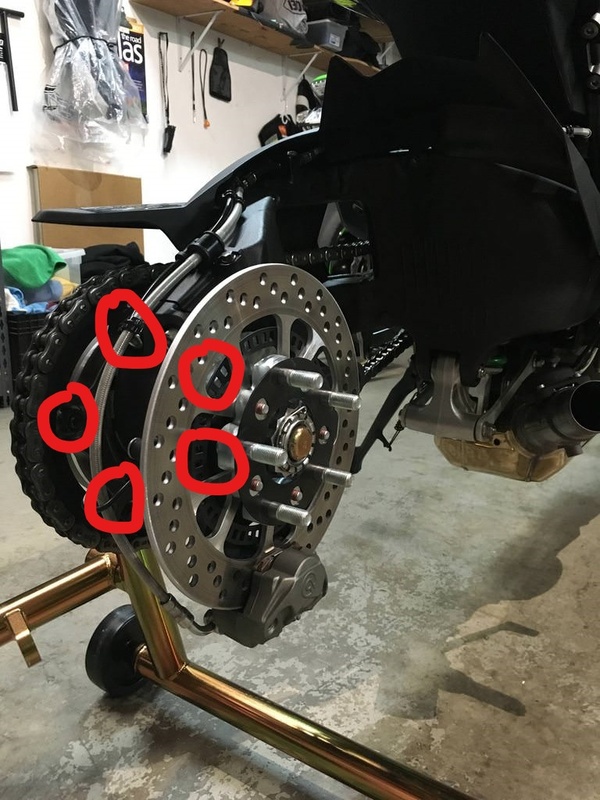 I have a Baxley front wheel chalk (internet pic below) which I roll the bike into and then remove the hub, flip it over on a towel and then use an impact gun to remove the 5 nuts, and do the sprocket swap. If you don't have a wheel chalk then just leaving the bike on the side stand like Bob does is fine, but I prefer the bike to be upright. Keep in mind that I break the chain & swap front & rear sprockets every time I go from street to track, most owners wouldn't have this need.